This idea has been floating about the internet for a while and I finally decided to give it a try last month. I loved it! And my family gave it 2 thumbs up. 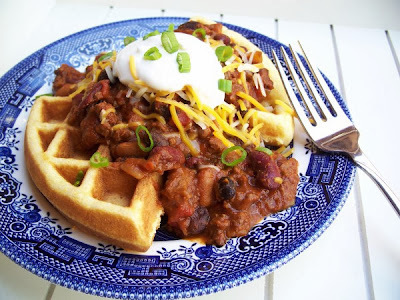 Essentially, instead of making cornbread muffins to go with your chili, you make cornbread waffles and serve them with the chili on top. It's a very filling and satisfying meal. In fact, I found I couldn't eat an entire waffle - instead I only used 2 quarter sections for my serving. You can use your own chili recipe or the simple one I've shared below. In a large pot, brown the ground beef with the onions; drain. Add all remaining ingredients except salt and pepper and bring to a boil; reduce heat, cover, and simmer for 1-2 hours, stirring occasionally. Season with salt and pepper, to taste, before serving. Alternatively, after browning beef with onions, transfer to a slow cooker with remaining ingredients and cook on low for 8-10 hours. Can be topped with cheese, sour cream, and sliced green onions. Preheat waffle iron. In a large bowl, combine corn meal, flour, baking powder, sugar, and salt. Add eggs, milk, and oil and stir just until smooth. Pour batter into hot waffle iron and bake in batches. Makes 4 7-inch waffles. Spoon warm chili over waffles or waffle sections. Garnish with toppings.